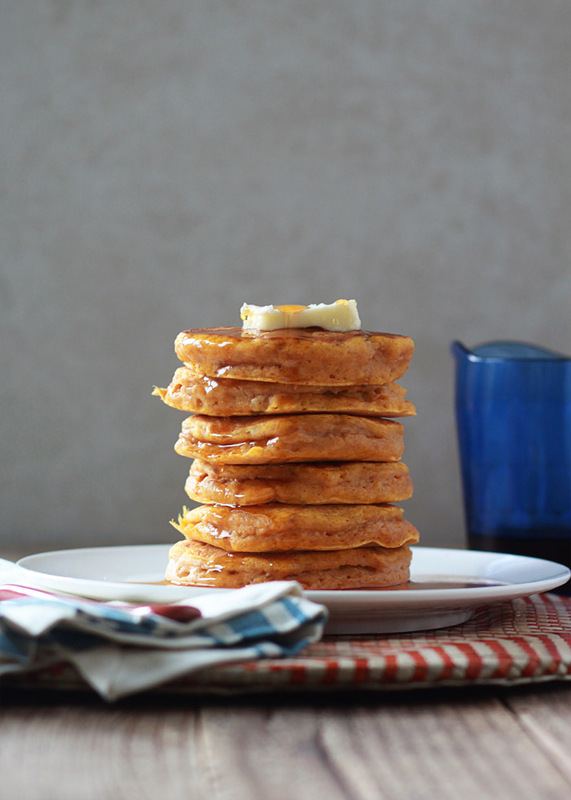 Super-fluffy, tall, yet moist pumpkin pancakes. Yes, you can have it all in a pumpkin pancake! Fall gets fluffy! Moist pumpkin and warm autumn spices in a super-fluffy pumpkin spice pancake package. Done deal. I just never know when a recipe is going to take off. It’s all one big fat guessing game. I had a feeling people would like this and it would do well (and so far, it has!). On the other hand, I was convinced these would do well, but nope. And then there are the recipes that are a huge surprise. Fluffy Banana Pancakes are consistently one of the most-visited and most-made recipes on my site. I knew I loved them, but I didn’t realize they would be so popular. And, of course, I am happy they are! I set out to create a pumpkin pancake recipe that’s full of those favorite fall flavors – pumpkin and pumpkin spices – yet tall and fluffy too. But no whipping egg whites, please, because who wants to do that at 7 a.m.?! Not me. 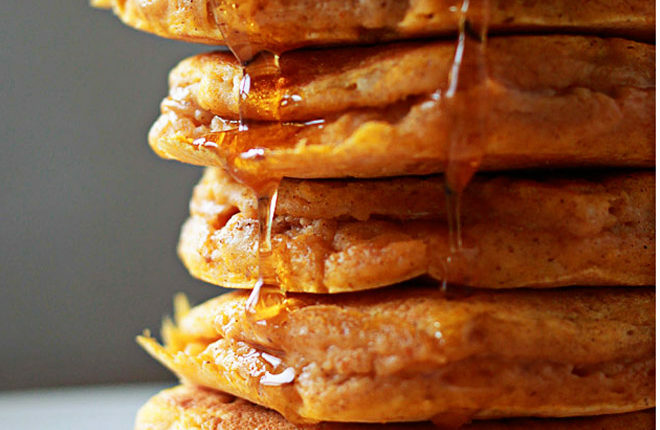 For this recipe for pumpkin pancakes, it’s all about the fluffy! I took the original recipe and swapped the banana for pumpkin, added a hefty dose of warming pumpkin spices, and increased the sugar – just a bit – to keep them from going over to savoryville. More made-up words. Sorry. 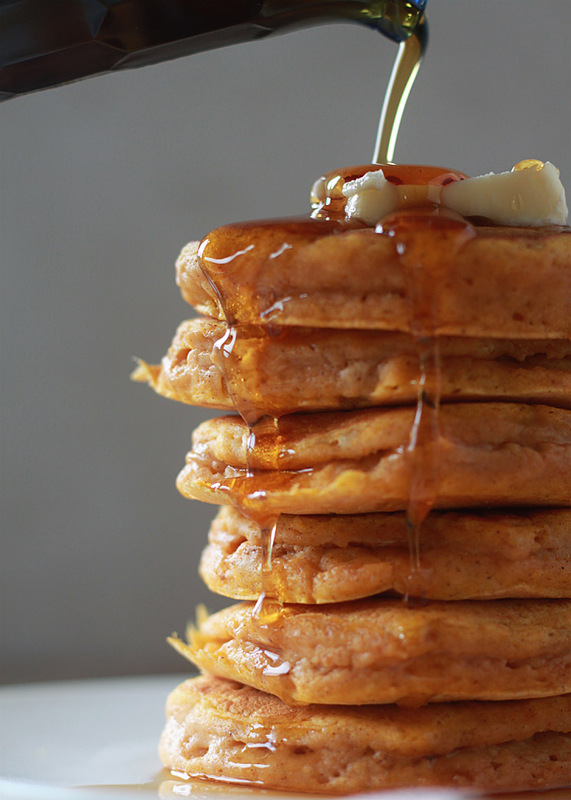 These pumpkin spice pancakes cook up surprisingly tall, but they’re not crazy or anything. They’re just right – perfectly fluffy for fall. See ’em made by clicking “play” here, or scroll on down for the straight-up recipe. Substitute unsweetened almond milk for the milk. Substitute vegan butter or coconut oil for the butter. I like making up words, too. It’s a writer thing. I love the word fallified, but I think I will love these pancakes even more. Thanks so much for the recipe. Pinning it now. Ha, thanks! My pumpkin frenzy started early this year. I’m actually trying to hold back – lol! Hi Kare! 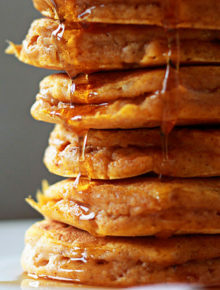 These sounds fabulous… and one can never have too many fluffy pancake recipes in their arsenal! I’ll take it! Beautiful photography, too! Thanks Kare!! Fluffy pancakes are a life need, in my opinion! 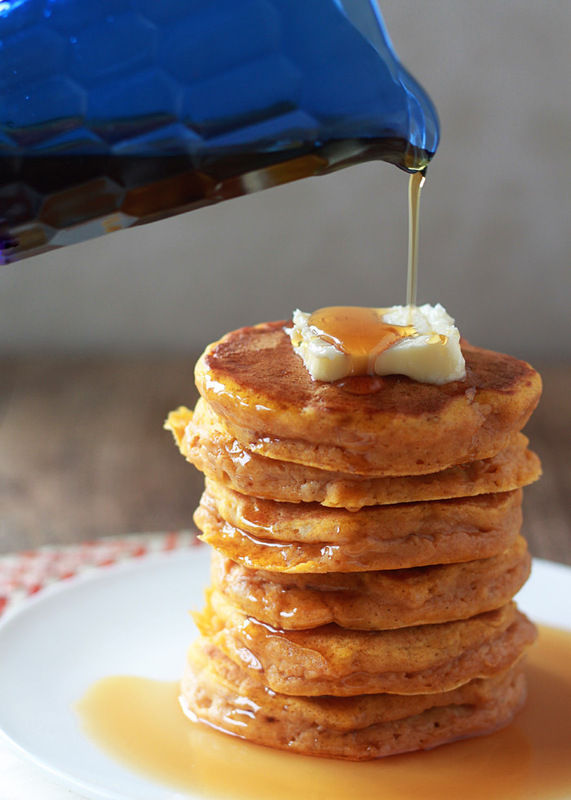 That picture of the syrup running down the stack o’ flapjacks? UGH! BEE U TEE FUUUUULL!! I want pumpkin in my pancakes asap. Wow, these pancakes do look seriously fluffy! Such a delicious and perfect fall breakfast. I don’t make pancakes too often, but now I’m seriously craving them. Pinned! I know nothing about pancakes – can I substitute a more healthy flour (ala buckwheat) and still have something palatable? The answer is sometimes. Buckwheat can be a little tricky in pancakes – I’ve found it’s usually better when it only replaces some of the flour, not all. I usually use whole wheat or white whole wheat flour in pancakes instead of all-purpose and that one-for-one swap works great. OH. MY. GOD. Pure Zen. Divine. Mindblowing. P.S. I made buttermilk out of 1,5% milk and lemon juice and replaced granulated sugar with dark muscovado (just not keen on white sugar). These were especially delicious with a dollop of slightly sweetened sour cream on top. It sounds a little weird, but it is amazing! Thanks for this recipe! I’ve made several pumpkin pancake recipes over the years, but this one has been the best so far. They were super fluffy. I didn’t have pumpkin pie spice so I referred to your spice blend, but I doubled all of the spices and it was awesome. Definitely a keeper. OMG, these were the **best** pancakes ever! Ever! We made a half-recipe, which gave us 8 pancakes. I sprinkled chopped pecans over the tops while the first sides were cooking— chopped bacon would have also worked. We cooked these on an electric griddle, set at 350º, for 3 minutes per side. Pumpkin Pecan PERFECTION. these smell just wonderful and taste great. have you ever tried separating the eggs, whipping the whites to peaks then folding them in last?? that works great for normal pancakes. bet it would with these too. thanks for the lovely recipes. These were great! We halved the recipe and it was plenty for two people. 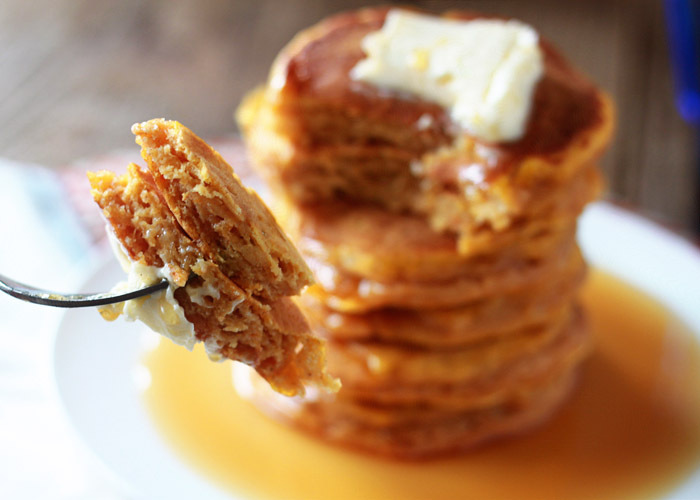 These pumpkin pancakes are just perfect. Made them with apple cider vinegar and whole milk instead of buttermilk. They are excellent! I usually use light brown sugar in my pancakes, how much would be the equivalent in this recipe? or should I just use 1/3 cup packed? I am trying these out today! The hubby wanted pumpkin pancakes. I will let you know how I like them! They look delicious. The batter is too dry and will not pour or make pancake shaped object. Am adding water. Had to had water several times to get this to flow and make pancakes. I followed recipe to a T, used buttermilk. Same thing happened to me! It was too thick and had to add water. Taste is great! Just been a little tricky to get the consistency right. They were awesome! Very fluffy. Just the right amount of sweetness. And it went perfect with my honey, cinnamon butter! Thanks for sharing the recipe with us! Delicious, thank you! Next time I’ll cut the recipe in half, I usually don’t make enough pancakes but this made plenty! I’ll also double the spices for personal preference. Best pumpkin pancake recipe ever!! These pancakes are delicious and fed a crowd! We’re trying the banana version tonight – can’t wait to pull them off the griddle! Can I use almondmilk instead of buttermilk? Thanks! Yes, I have done that – but I like to make buttermilk with the almond milk (mixing almond milk with a little vinegar) for extra lift! Thanks for the reply! I’ll probably try that! HI! These sound and LOOK amazing! Wondering if they can be made in advance and frozen for a later use when a stove wont be available? We are going camping in a couple of weeks and I would love to make these, and then reheat on the camp fire (in foil). Thanks! Hi Amanda, I have made these ahead of time with success. I freeze them then I actually reheat them in a toaster. You won’t have a toaster (but wouldn’t that be nice while camping?! 😉 but I would think your campfire reheating plan should work! Have fun! Thank you so much for your quick response!!! These pancakes are absolutely delicious! This is my favorite pancake recipe of all time! My son loves them, and I make them in double batches and freeze them for the family I nanny for. They’re a hit! This was the best pumpkin pancake recipe I’ve ever made. The pancakes came out very fluffy and delicious. I increased the whole wheat flour and reduced the sugar and it was still great. I will definitely save this recipe. Thanks. I started using this recipe this fall – SO good! Always a hit with my 3 kiddos. Thank you! WE LOVE these pancakes! My kids beg me to make them. I have shared your pin and this recipe page countless times. Thanks for a fabulous pancake recipe! Love these pancakes! I live in Korea, where small sweet pumpkins ( the green ones) are abundant. I like snacking on steamed sweet pumpkin slices, and I had one slice leftover in the fridge, which scraped out and mashed was close to 1/4th of the amount of puree needed, which is perfect for me since I live alone and am cooking for 1. So I cut the recipe to a 4th and made silver-dollar pancakes. I substituted coconut oil for the butter and almond milk with apple cider vinegar for the buttermilk and they came out lovely! Super fluffy and thick, like I’ve always wanted my pancakes to be but could never quite get right! These are quite good by themselves or with strawberry jam, too. I thought I would have some as a snack now and some for breakfast tomorrow…but they’re so good I devoured them all in one sitting! Oops! My daughter loves these. I made them plain and with blueberries. Great recipe! Light but hearty pancake. Subtle spice. Lovely! The best pancakes ever. They tasted like pumpkin pie. These were delicious! I made them dairy free and swapped the flour for my favorite gluten-free flour blend. (Which means I had to add an extra 1/4 almond milk because gf flour tends to dry recipes out) but these turned out amazing! My husband (who is not gf) can’t stop talking about them! Yay! So glad you and your husband liked them. Love hearing about GF flour working well, that will be a great option for GF readers! Hmm, I’ve never baked pancakes, so I can’t say! Sorry I can’t be any help. These were fluffy and delicious! Love the pumpkin. Saving this one. — thanks! I have a 6 year old who is a very picky eater and she absolutely loves these! Thank you for sharing the recipe. Great recipe! They are cooking right now, and smell like pumpkin pie. Thanks! I’ve made this several times and it is OUTSTANDING!!! I have used left over orange fleshed roasted winter squash in lieu of pumpkin two times. I don’t have pumpkin pie spice for I follow the blend at the bottom. I use real buttermilk (low fat). I love to serve topped with whipped cream. This makes 4-5 large pancakes for me. One pancake is a very hearty, stick to your ribs meal. I serve to picky kids and a husband with refined tastes and it is a hit. My family and I love this recipe! I think we would choose these pancakes over regular pancakes hands down! They’re just what the doctor ordered, moist and fluffy. Love that this recipe also comes with vegan options! Thank you they were delicious!